The City of Gloucester needs your help in keeping our waterways and streets clean. Fats, oils, and grease build up in our City's sewer system and causes blockages as they coagulate; blockages can result in sanitary sewer overflows that pollute the environment and damage properties. By following just a few simple clean-up measures while cooking, you can help eliminate unwanted grease. Your efforts will greatly help to reduce sewer maintenance and operation expenses as well as reduce the public health risks associated with sanitary overflows. Remember that every household plays an important role in preventing neighborhood sewer blockages. Why are fats, oils, and grease a problem? If you pour fats, oils, or grease down your drain, it may adhere to pipe walls. This can build up, restrict, or completely block your pipes, and cause rancid odors or messy and costly sewer backups in your home or overflows into your neighborhood. FACT: Fats, oils, and grease are the No. 1 cause of sewer backups in homes. Where do fats, oils, and grease come from? Restaurants, condominiums, apartment buildings, homes, schools, churches, food-processing plants, shopping malls, caterers, hospitals, retirement/assisted living facilities, and many more locations all produce fats, oils and grease. FACT: Fats, oils, and grease are derived from plant and animal sources and are a by-product of cooking. 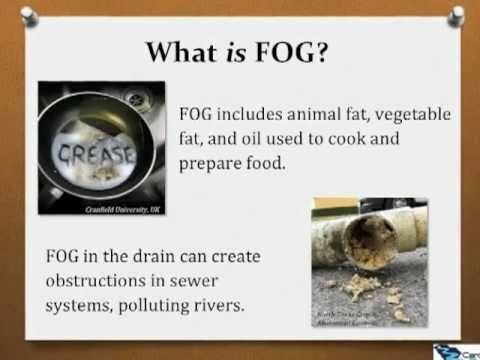 FOG is found in the following - meat fats, lard, cooking oil, shortening, butter/margarine, food scraps, baking goods, and sauces and dairy products. Never pour fats, oils, or grease down the sink, garbage disposal, or toilet. Pour fats, oils, and grease (after it has cooled) into a container. Once the container is full, secure with a lid and place it in the trash. Before washing, scrape and dry wipe pots, pans, and dishes with paper towels and dispose of materials in the trash. Minimize use of garbage disposals. FACT: Home garbage disposals do not keep grease out of the plumbing system. Moreover, hot water and products such as detergents that claim to dissolve grease only pass it down the line and cause problems elsewhere. National Restaurant Association produced toolkit that includes information on Best Management Practices, elements of FOG control programs, tips on cleaning grease control devices, and more. This is a list of waste companies in the Gloucester area who provide grease trap cleaning and maintenance services.